Description: KCS 4126 rear DPU on the KCS 4052 SB grain,is seen here preparing to clear the siding and enter the main @ MP 141.4. Description: One of the more challenging shots in the area is this shot of a northbound passing the signal at Roller Av in Decatur, just north of the station. The Simmons plant keeps the tracks in shadow much of the afternoon, but during the longer days of summer, its possible to get this shot with the power and signal lit up. Because the angle is low by then, it makes for an attractive shot. We see a northbound 84 car H train. Description: Retro Belles lead a northbound manifest down Rich Mountain at Page Oklahoma. Description: Northbound manifest rolls down KCS's Shreveport Sub. Description: Northbound manifest nears Heavener. Description: Northbound manifest starts up the Heavener Sub. Title: Kansas City Southern, in Northeast Arkansas! Description: Our first daylight siting of the new look KCS. A nice set of ACe's passing through Neptune Street. Description: Portland - Pasco with a Belle. Title: 08112730 Westbound BNSF freight approaches Nicollet Island on Wayzata Sub. 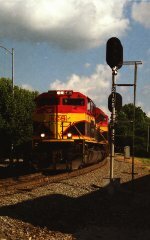 Description: Rare sighting of a KCS unit leading a westbound out of Decatur on the NS main. Description: Set of light power rolls north through Rich Mountain on its way back to Pittsburg Kansas. Description: Light power returns north as it rolls through Rich Mountain. Description: From Left to right, a BNSF Track Inspection train, a BNSF coal train, a UP coal train, and the EB KC Mule, about to depart for St. Louis. 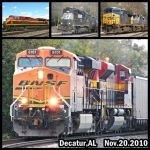 Description: A collage of the trains I seen in Decatur! Description: The Scherer Coal train comes through Decatur w/ a KCS Belle in the second position! Title: Its Time For Your Coal Facial!